Here in NYC, on the second to last March weekend before Easter, one last snow storm is supposedly heading our way. While my family and friends seem really bummed about it (we’re ready to jump head first into barbecue season), I turn to my number one winter coping skill, souping-braising-stewing. As long as I have a few aromatic ingredients (for a flavor foundation) beans, beef, bones, and/or vegetables on hand and the music fired up, I press my enamel cast iron pot into action. Soon, delicious scents begin to fill the apartment, the kitchen warms up, and all seems perfectly cozy in that very snowy moment in time. Jamaican pumpkin soup is a favorite; super easy to make and chock full of spinners–one of the more toothsome dumpling styles you can eat. Little pieces of the dough are rolled between your palms straight into the simmering soup. As a child I fell in love with this soup, made with a pig tail, and piece of boney beef as a base flavoring. 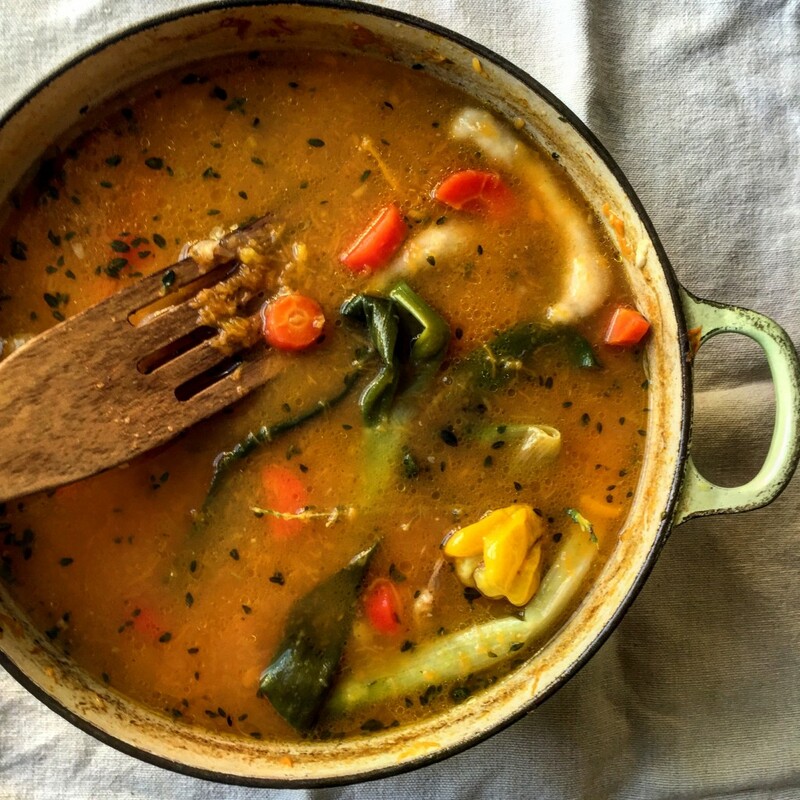 Nowadays you often find this soup flavored with a bouillon cube or powdered yellow flavoring, which is such a shame! Skip the pig tail, and use a piece of beef shank, still one of the more tasty affordable cuts of beef you can buy. I have a pound and half piece, full of meat that I bought this week for $4.50. Any time I see it in the market, I buy a piece and keep it in the freezer. I use calabaza, a large winter squash that resembles your typical Halloween pumpkin and is typically grown in the West Indies and South America, and can be found in many ethnic markets. Otherwise substitute with pumpkin, kabocha, or butternut squash. Once cubed and simmered, the pumpkin or squash disintegrates into a gorgeous orangey-hued broth. Scallion, garlic, thyme, and Scotch bonnet pepper form the supporting seasoning. By dropping a whole pepper into the simmering soup pot, a lovely floral flavor permeates the broth, without making it too spicy. If you want the heat from Scotch bonnet, just pierce the pepper at the end and squeeze out as much hot-spiciness as you want. But be sure to remove the whole pepper before serving, otherwise someone may be liable for a spicy surprise. Here is my original recipe complete with a video. Collect your ingredients today and we’ll ride out the last of winter together. Thanks Kendra–figuring this all out right now.